Located at a distance of around 14 km from Alleppey, Sri Krishna Temple at Ambalapuzha is typical temple architecture of Kerala. 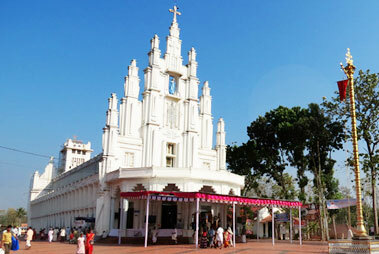 It is believed that the temple was built somewhere between 15th and 17th century AD by the King Chembakasserry Pooradam Thirunal-Devanarayanan Thampuran. The inner walls of the temple are adorned with the paintings of Dasavatharam, the 10 incarnations of Lord Vishnu. An important Vaishanava temple of Kerala, it is also famed as Dwaraka of the South. The idol resembles Parthasarthi (the form that Shree Krishna took during Mahabharata) has a Shankh (sacred conch) in the left hand and a whip in the right. This temple is also linked to the Guruvayoor Sree Krishna Temple. In the year 1789 when Tipu Sultan raided the area near Guruvayoor Temple, Lord Krishna’s idol was brought at the Ambalappuzha Temple to keep it safe. The sweet milk porridge- Palpayasam, prepared for the deity is also quite popular. It is quite popular amidst the devotees, visiting the temple. It is believed that the Lord himself comes here to enjoy this tasty Prasad. The annual festival of this temple is celebrated in the month of March/April. After every 12 years, the event of Palipana is also held here.